The idea is to automatically activate a noisy siren from a sound file when opening the excel file as the market index value drops to, or is below, the minimum expected value. The market index value is refreshed every 30 minutes. Eg. 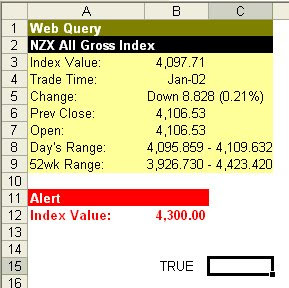 the index value alert is 4,300. If the market index value is below 4,300, the noisy siren will be automatically activated. I first set a WebQuery for the market index latest price with automatic refresh every 30 minutes. Then, apply VBA macro to call a sound file.